This article was originally published by Henri de Villiers on his blog the Schola Sainte-Cécile. It is translated and published here with permission. In all of the ancient Christian liturgies there is a period of preparation for the great fast of Lent, during which the faithful are readied for the coming of this major period in the liturgical year so that they can gradually enter into the ascetic practices that they will observe until Easter. This preparatory period of Lent lasts for three weeks in the majority of rites. In the Roman Rite, these three Sundays are called Septuagesima, Sexagesima, and Quinquagesima. These names come from an ancient counting system, and refer to the period of ten days in which each of these Sundays falls. They precede the first Sunday of Lent (Quadragesima). Churches following the Syrian and Coptic traditions have preserved a more ancient arrangement that includes shorter periods of fasting: the Fast of Nineveh and the Fast of Heraclius. The origins of the period of Pre-Lent in other rites can probably be traced back to these. Reminders of human frailty, meditation on the last things, and also prayers for the dead are recurrent elements in this liturgical period. Inexplicably, the modern rite of Paul VI suppressed the time of Pre-Lent in its liturgical year, despite its antiquity and universality. The word of the Lord came to Jonah a second time, saying, 2 “Get up, go to Nineveh, that great city, and proclaim to it the message that I tell you.” 3 So Jonah set out and went to Nineveh, according to the word of the Lord. Now Nineveh was an exceedingly large city, a three days’ walk across. 4 Jonah began to go into the city, going a day’s walk. And he cried out, “Forty days more, and Nineveh shall be overthrown!” 5 And the people of Nineveh believed God; they proclaimed a fast, and everyone, great and small, put on sackcloth. 6 When the news reached the king of Nineveh, he rose from his throne, removed his robe, covered himself with sackcloth, and sat in ashes. 7 Then he had a proclamation made in Nineveh: “By the decree of the king and his nobles: No human being or animal, no herd or flock, shall taste anything. They shall not feed, nor shall they drink water. 8 Human beings and animals shall be covered with sackcloth, and they shall cry mightily to God. All shall turn from their evil ways and from the violence that is in their hands. 9 Who knows? God may relent and change his mind; he may turn from his fierce anger, so that we do not perish 10 When God saw what they did, how they turned from their evil ways, God changed his mind about the calamity that he had said he would bring upon them; and he did not do it (Jonah III). The whale spewed Jonah out on dry land near the city of Nineveh. In order to commemorate the fast of the Ninevites, the churches of Syria instituted a fast from the Monday of the third week before Lent (corresponding to the Monday of the Roman Septuagesima). These days of fast are called Baʻūṯá d-Ninwáyé in Syriac, which we could translate as the Rogation (or Supplication) of the Ninevites. It seems that this fast initially lasted a whole week, or more precisely from Monday to Friday, because fasting on Saturday and Sunday is unknown in the East (though it was possible to extend a period of abstinence without fasting into these two days). Later the Fast of Nineveh was reduced to three days: Monday, Tuesday, and Wednesday (and Thursday became a “day of the thanksgiving of the Ninevites” in the Syro-Chaldean rite). Traditionally the fact that the fast lasts three days is explained by the three days Jonah spent in the whale. The very strict Fast of Nineveh is still practiced by the various Aramaic churches, in both the oriental tradition (the Chaldean, Assyrian, and Syro-Malabar Churches) and the western (the Syriac Church). During these days, the book of Jonah is read (by the Assyro-Chaldean, on the third day). This fast has remained very popular, and certain faithful go so far as not to eat or drink during the three days. Alone among the churches of the Syriac tradition, the Maronite Church no longer observes the Fast of Nineveh properly speaking, though (as we shall see later) it has adopted the arrangement of three Sundays of preparation for Great Lent. The Coptic Church of Egypt, as well as the Ethiopian Church, received from the Syrian Churches the practice of the Rogations of the Ninevites. In the Egyptian Coptic liturgy, these three days of rogation in memory of the fast of the Ninevites (also called the “Fast of Jonah”) strictly follow the liturgical customs of Lent (the Mass is celebrated after Vespers, the hymns are chanted in the Lenten tone and without cymbals, the readings are read from the Lenten Lectionary). The Fast of Nineveh was adopted by the Coptic Church of Egypt under the 62nd patriarch of Alexandria, Abraham (or Ephrem) (975 † 978), who was of Syrian origin. It is possible that the adoption of the Fast of Nineveh in Ethiopia was more ancient. (The first bishop of Aksum, St. Frumentius, was a Syrian and the Church of Ethiopia was reorganized in the 6th century by the nine new Syrian saints, who contributed greatly to the evangelization of Ethiopia.) The Fast of Nineveh (Soma Nanawe) is very severe in the Ethiopian Church and no one can be dispensed from it. When was the Feast of Nineveh adopted by the Syriac Churches? There is some evidence it was probably practiced in very ancient times. St. Ephrem, a deacon of Edessa, composed several hymns on the Feast of Nineveh (in which it appears that the fast lasted a week and not three days as today). The Armenian Church has a Fast of Nineveh that lasts five days: it begins on the same Monday as in the Syriac Churches (the third Monday before the start of Lent) and ends on the following Friday (when they recall Jonas’s appeal to the Ninevites), or a complete week (the Armenians never fast on Saturday or Sunday). The fast and abstinence of these days is severe, similar to that of great Lent. Armenian authors claim that it was instituted by St. Gregory the Illuminator after the general conversion of the Armenians in 301. Probably St. Gregory the Illuminator only renewed a custom that was already common among the neighboring Syriac Christians. In the East as in the West, the week immediately before Lent very early takes on a penitential character. A first abstinence from meat begins then. Recall that in the primitive Church Christians followed a strictly vegetarian diet during the whole of Lent. In the week immediately before Lent (in Latin Quinquagesima, in Byzantine Tyrophagy), meat is no longer consumed but dairy products, eggs and other animal products are still consumed. Lent lasts for seven weeks in the East and six weeks in the West. In the East, where neither Saturdays nor Sundays are fasting days (apart from Holy Saturday), this makes for a Lent with 36 days of fast. In the West, where Saturdays but never Sundays are fasting days, the number (before Gregory the Great) amounted to the same 36 days. To compensate for missed fasting days and to reach the symbolic number of 40 (the 40 days of Christ’s fast in the desert) while making room for the possible occurrence of feasts that dispense the fast (principally the Annunciation), pious Christians chose to anticipate the official beginning of the Lenten fast by one week. The abandonment of meat in the week before Lent is attested in the West at an early date. The Sunday of Quinquagesima is called in the ancient Latin books “Dominica ad carnes tollendas” or “Dominica ad carnes levandas” (hence the name Carnival), which indicates that they began to remove meat from their diet on the day after this Sunday, before passing to a strictly vegetarian diet on the next week. The first Sunday of Lent is called “in capite jejunii” (at the beginning of the fast). Recall that before St. Gregory the Great, Roman Lent did not begin until the Monday following the first Sunday of Lent (an arrangement conserved among the Ambrosians and Mozarabes). St. Gregory caused the fast to begin on the Wednesday of Quinquagesima to make for a round number of 40 days of fasting (nevertheless, to this day the Roman Rite maintains the order of offices of Quinquagesima after Ash Wednesday, and the rubrics proper to Lent do not come into force until the first vespers of the first Sunday of Lent). The Liber Pontificalis attributes the institution of Quinquagesima Sunday to St. Telesphorus, the 8th pope reigning from 125 – 136/138. This attribution may be legendary, but since the part relating to Pope Telesphorus was written under pope St. Hormisdas (514 † 523), we can infer that the custom was already immemorial at that time such that it could be plausibly attributed to such an ancient pontificate. The Leonine Sacramentary contains a Mass for Quinquagesima. its texts are said to have been written under pope Vigilius around 538. In the East, there is very early evidence for the existence of Cheesefare Week one week before Lent. The pilgrim Egeria (Itinerary 27.1) reports that in Jerusalem it had been customary since the 4th century to add an eighth week of penance. In the 5th – 6th centuries the Georgian lectionaries, witnesses to the liturgy of Jerusalem at this period, have proper readers for the two Sundays before Lent. “Subsequently the Fathers deemed it good to add another week as a preparation to dispose those who are about to enter the fasting period, and to honor these fasts with the holy number forty days that Our Lord himself fasted” (Dorothy of Gaza, Spiritual Works, XV, 159). The custom of a week of penance immediately before the start of Lent, attested before the 6th century (St. Severus of Antioch counts it in his description of Lent), would later be sanctioned by several official decisions in the 7th century under the reign of Heraclius. The origin of the Fast of Heraclius is uncertain. The majority of authors say it is related to the events of the war between the Roman byzantine Empire and the Persian Sassanid Empire from 602 – 628, during which the Jewish populations of Palestine rebelled against the Christians and the rule of Constantinople, and allied themselves with the Perisan troops. As a result of the war, Jerusalem fell into Persian hands, \ the relic of the True Cross was taken to Persia, and 90,000 Christians were massacred. In 629 when jerusalem had been retaken and Heraclius entered in triumph, all the Christian churches including the Holy Sepulcher had been destroyed. The Emperor ordered the massacre of the Jewish rebels, despite having promised them amnesty. In penance for this perjury, the patriarch of the Church of Jerusalem instituted a week of fast before the beginning of Great lent. The fast initially lasted for only 70 years, but remains to this day in the form of the Fast of Heraclius among the Copts of Egypt and Ethiopia. This is the most widely-accepted explanation, but there is another: Heraclius ordered his troops to observe a week of abstinence from meat and a reduced consumption of dairy during the sixth year of the war against the Persians, in order to implore God for victory. It is possible that both explanations are true, and more than probable that they only justified an already existing custom. In the following century, St. John of Damascus writes that Lent is preceded by one preparatory week (The Holy Fast, 5). The institution of a week of mitigated fasting just before Great Lent, observed at a very early date in both East and West, had two virtues, one symbolic and the other practical. On one hand, these days of partial fast were seen as a compensation to attain the number of 40 true days of fasting. On the other, it facilitated the transition into the strict vegetarian diet of Lent. In the 6th century in both East and West, the custom of having one week of abstinence from meat before the start of Lent was already well-established. Only the 24th canon of the Council of Orleans in 511 proscribed the observance, a proof e contrario that the practice had extended into Merovingian Gaul already before that date. Several Churches in the East added the Fast of Nineveh in the third week before Lent. Henceforth it was tempting to tie these two periods together, and to extend Pre-Lent to three weeks. It is possible that in the East this liturgical bridge between Lent and the Fast of Nineveh took place first in Armenia. The Armenian period before Lent is called Aratchavor. It spans three Sundays. Septuagesima is called Barekendam (or last meat day). The first week is strict and dedicated to the Fast of Nineveh (instituted by St. Gregory the Illuminator in the 4th century). The second and third week are less marked by penance, and there is only fasting on Wednesdays and Fridays. Sacramentary of Charles the Bald, folio 3 r°: St. Greogry the Great dictates his liturgical books to his scribes under the inspiration of the Holy Spirit. In Rome, the 6th century witnessed the addition of two more Sundays before Quinaquagesima: Sexagesima and Septuagesima. The Epistolary of Victor of Capua (546) proves that Sexagesima Sunday existed in this period. The ancient Gelasian Sacramentary (Vat. Reg. 316) contains proper prayer texts for Septuagesima and Sexagesima. The stations for these three Sundays were fixed under Popes Pelagius I (556 † 561) and John III (561 † 574) in the basilicas of Saint Laurence, St. Paul, and St. Peter. We have the homilies given by St. Gregory the Great for Septuagesima, Sexagesima, and Quinquagesima. Further, it is likely that St. Gregory refashioned the liturgies of these three Sundays to accentuate their penitential character. The most ancient known Roman lectionary, the Lectionary of Würzburg (produced in the first half of the 6th century) which was used in Gaul and corresponds to the structure of the Gelasian Sacramentary, shows that the readings we use today for the three Sundays of Septuagesima, Sexagesima, and Quinquagesima, were already in use. Most medieval diocesan variants of the Roman Rite also included special readings for Wednesdays and Fridays during these three weeks, a reminder that these fasting days once included special liturgical stations. In this period, the Byzantine rite opted to read Gospels that prepare the faithful for Lenten penance. The order of these three weeks is attested in the Typikon of the Great Church (9th – 10th centuries); the absence of more ancient liturgical documents prevents us from being able to specify a more exact date for this ordering. Note that during the week after the Sunday of the Publican and the Pharisee, as a result of complex medieval polemics, the Byzantines completely suppressed all fasting, even the customary Wednesday and Friday fasts, in order to distinguish themselves from the Armenian fast of this same week. Only a few rare rites, isolated from the general current of Christendom by the progress of Islam, did not develop the three weeks of pre-lent. Thus the Hispano-Mozarabic Rite did not develop from the primitive, pre-6th century stage of one Sunday of preparation (Quinquagesima). This Sunday is called ‘Dominica ante carnes tollendas,’ indicating that Lent was preceded by a week when meat but not dairy or other strictly non-vegetarian foods was cut back. Egypt and Ethiopia have both the Fast of Nineveh and the Fast of Heraclius, but not joined into one period of Pre-Lent. Among the Ethiopians, however, the Sunday corresponding to Latin Sexagesima–though reckoned liturgically as part of the time after Epiphany–is fixed in relation to the following Sunday (Quinquagesima–Za-Warada or Qabbaka som): it is Bridegroom Sunday (Zamana Qebbala Mar’awi)(because the antiphons use texts from Matthew 25:1-13). It also marks the end of the time when marriages are permitted. Finally, the Assyro-Chaldeans have only the Rogations of the Ninevites and have no equivalent to Quinquagesima. 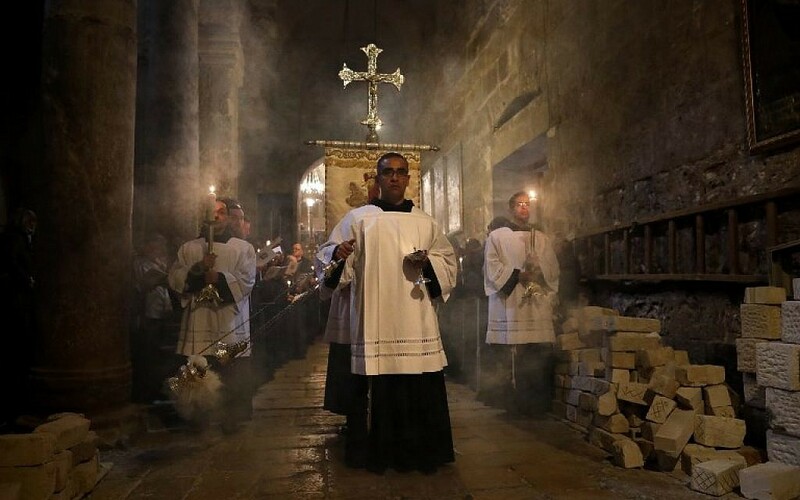 The following is an interview with Brother Stéphane Milovitch, OFM, superior of the Franciscan monastery of St. Savior in Jerusalem, about his role in caring for the patrimony of the Holy Sepulcher. He tells us about some the most striking pieces from the collection, and the exciting new Terra Sancta museum opening this fall in Jerusalem. Also published at Liturgical Arts Journal. 1) In addition to your responsibilities as Guardian of the Franciscan Community at St. Savior Monastery in Jerusalem, you are also the person in charge of the Cultural Heritage of the Custos of the Holy Land. What does that job entail? I entered the Custody of the Holy Land in 1992 after studying mathematics in France. Ordained a priest in Jerusalem in the year of the Grand Jubilee of 2000, I was given the obedience of studying liturgy in Rome at the Benedictine Academy of Sant’Anselmo. The subject of my doctorate was a study of the daily procession that the Franciscans have performed for the last 700 years without interruption out of love for the Holy Sepulcher, re-enacting the Paschal Mystery of the passion, crucifixion, death, deposition, embalmment, placing in the tomb, the glorious resurrection, and apparition to Mary his Mother and to Mary Magdalene. The Franciscans are celebrated the eighth centenary of their uninterrupted presence in the East. The only Catholic religious in the Holy Land for many centuries, we have peaceful recovered, one after another, the various sanctuaries of the Redemption that in the 12th century the Church seemed to have lost forever. These sanctuaries are places to which pilgrims from the whole world come to prayer and celebrate they are also places where the Franciscans celebrate the Latin liturgy every day in the name of the Catholic Church. In the sanctuaries of the Holy Land pilgrims celebrate every day the Mass “of the place” and not the place “of the day,” for actually it is always the Annunciation at the Grotto in Nazareth, Christmas in the Grotto in Bethlehem, Good Friday on Calvary, and Easter at the Holy Sepulcher, etc. When the Mass of the day and the Mass of the place coincide, i.e. when we celebrate a feast of the calendar on the very Gospel place that is the origin of that feast, we have a statio: a liturgy celebrated solemnly throughout the whole day (Liturgy of the Hours and Eucharist) by the Custody by the Franciscans of the convent of St. Savior in Jerusalem. In the West, everyone (sovereigns and faithful) grasped the spiritual importance of these stational liturgies. Throughout the centuries, the friars have received gifts of great artistic quality with the intention that, during these celebrations, these gifts would represent the donors who were not able participate in these liturgies in person. Over the centuries, we have found ourselves with a very rich liturgical, artistic and cultural patrimony coming to us from the entire world, which we would now like to present to all those who appreciate the human artistic genius fostered by faith in Jesus Christ. Moreover, the quality of these objects testifies to the faith of their artisans and donors. 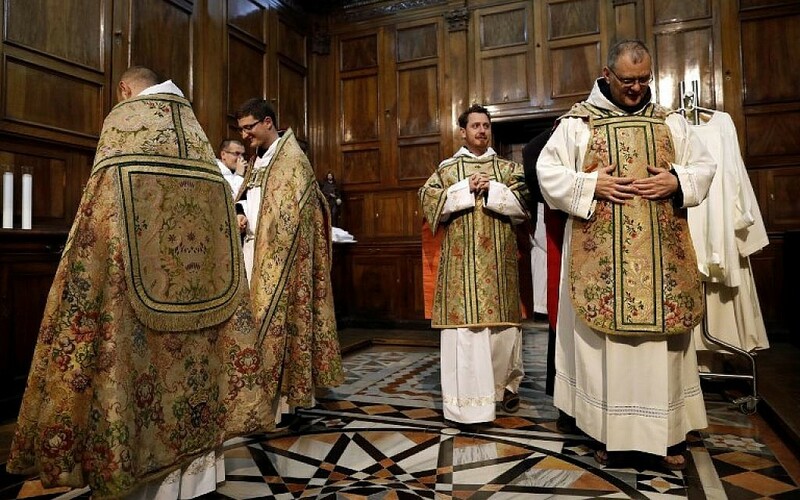 Until a decade ago, the rich liturgical and historical patrimony of the Custody was jealously preserved by our sacristans who would employ it intelligently in liturgical celebrations. They have also transmitted it to successive generations of Franciscans.Today, following the great exposition Treasure of the Holy Sepulcher that took place in 2013 at the Palace of Versailles, the Custody has become more aware of the exceptionality of its patrimony and decided to create—in addition to its numerous liturgical, social, educational, and welcoming activities—a department of Cultural Heritage that will continue to educate, study, and safeguard its patrimony. 2) The Franciscans are opening a new museum called Terra Sancta Museum. What is the motivation for the project? Jerusalem is a city where Jews, Christians, and Muslims live together. Jews and Muslims already have their own museums that manifest their presence in the Holy City. But Jerusalem is also a holy city for Christians. However, native Christians are not very numerous, barely 1% of the total population. Nevertheless, many millions of pilgrims come each year, showing thereby that Jerusalem is the city of the Resurrection of Our Savior, to which Christians from all over the world are attached. The creation of the Terra Sancta Museum will render a debt of justice to Jerusalem. The ensemble of these museums and cultural sites will show that Jerusalem is a universal city for all people, and thus also for Christians. The Terra Sancta Museum will be composed of two sections, now in the construction phase: the archeological section and the historical section. An archeological pilgrimage through the Holy Place, the archeological section will help visitors understand, by means of extraordinary pieces—frescos, ceramics, Byzantine mosaics, coins, capitals, vases found in tombs from the bronze age, sarcophagi, jewelry, lamps, ossuaries, etc.–the succession of different historical periods. It will also include collections originating in Egypt and Mesopotamia. This section will support the legitimacy of the sanctuaries venerated for centuries by the Franciscans and so many pilgrims. This archeological section is also provided with a multimedia room that presents the Way of the Cross (biblically, historically, and spiritually) and serves as an introduction to the pilgrims before they take the Via Dolorosa. This section covers the first Christian millenium. The historical section will gather together documents and images from the archives, from rare collections of painting and sculpture, but especially all the sumptuous presents that flowed here from the royal courts of Europe throughout history. Jerusalem drew the attention of all the Christian powers, anxious to leave a sign of there presence there. Chalices, candelabras, ciboria, works in solid gold, processional crosses, and rich liturgical ornaments…the works of art exhibited in this section will certainly attract the admiration of the public. This second section covers the second Christian millenium. 3) What sort of objects will be on display, is there a “theme”? On the day of Pentecost, the Church was born in Jerusalem: this was the universal Church of Jesus Christ, but also the local Church of Jerusalem. Since its beginnings and up to the present day, Jerusalem has kept its dimensions as a church both local and universal. The historical section of the museum is divided into two parts that put these two aspects of the Church on display. Introduction: the first room presents up front the central theme—the Resurrection of Our Lord—by means of a Neapolitan bas-relief in silver from the early 18th century. It is because Christ’s resurrection happened in Jerusalem that Christians come here on pilgrimage. The next room will serve as a transition to the presentation of the second millenium. It will illustrate the birth of the Church with its different rites—the various eastern Churches will also present icons from their patrimony—until the arrival of St. Francis in the Holy Land. First Part: the arrival of the Franciscans, the recovering of the sanctuaries and the rebirth of the local Church that disappeared after the Crusades, the return of pilgrimage, the return of the local Arab Christian community and a presentation of its patrimony. Second Part: western pilgrims (universal Church) and their presence in Jerusalem. A Spanish room, the pharmacy where the Franciscans treated Jews, Christians, and Muslims; a Portuguese room, a French room, an educational room to present the Latin liturgy to Christians who do not know it well and to non-Christians who do not know it at all; an imperial room; a room of the Italian peninsula (Genoa, Venice, Naples, Sicily, Lombardy, Papal States…). 4) Some people might think it is strange that the Franciscans possess such a rich treasury. Is there a contradiction between serving the poor and having beautiful liturgical objects? Shouldn’t the Franciscans sell some of these objects and give the money to the poor, who are very needy, particularly in the Holy Land? The Franciscans have no treasury. It is the treasury of the Holy Sepulcher, the patrimony that belongs to the Holy Sepulcher. The donors have not given anything to us; they have offered gifts to the sanctuary. In our capacity as guardians of the Holy Places we have the duty to preserve the patrimony that has been deposited with us. There have been difficult times in our history, times of crisis, economic crisis. Unlike the treasuries of the medieval cathedrals, the treasury of the Holy Sepulcher has never been exchanged for money because we are convinced that it does not belong to us. The apostolic works of the Franciscans in the Holy Land are the fruit of the generosity of Christians around the world. Already in the time of the Acts of the Apostles, the Church of Jerusalem owed its substance to the generosity of others (Acts 24:17; 2 Cor. 8:9). The offerings collected around the world for the Holy Land—in particular the Good Friday collection—are not earmarked for the museum or for the restoration of any artifacts but exclusively for the building up of the living Stones who are the local Christians who live around the sanctuaries (salaries, schooling, scholarships, construction of houses for struggling families…) and for the preservation of the sanctuaries. This is the reason why we humbly ask those who interested in art, liturgy, and culture to help us economically in our worthwhile enterprise. 5) About the liturgical objects in particular: What is the importance of beauty and quality in the liturgy in general, and for the Franciscans of the Holy Land in particular? Did St. Francis have anything to say about this? St. Francis always invited his friars to be Catholics, which meant inviting his friars “to celebrate the Divine Office according to the use of the holy Roman Church” (Rule of St. Francis, III, 1). For this reason, the friars have contributed to the diffusion of the missal of the Roman Curia. In many of his writings St. Francis strongly urges his friars to give special attention to the liturgy, to liturgical books, sacred vessels and vestments that all the friars must consider “very precious” (Letter of Francis to the Ministers of the Order, 3). In humility, we have tried to obey the order of our Holy Founder. Let us attend, all clerics, to the great sin and ignorance, which certain men have concerning the Most Holy Body and Blood of Our Lord Jesus Christ and the most holy Names and His written words, which sanctify the Body. It is difficult to say which one is the most beautiful piece: de gustibus non disputandum…That said, one must admit that the Neapolitan throne given by King Charles de Bourbon and Maria Amalia of Saxony is very beautiful. It is composed of a throne that seats either a superb cross in lapis-lazuli or an extraordinary monstrance. The throne consists of a niche surrounded by rocailles, with a marbling done in sapphires that accompany, at the summit, grape vines adorned with grapes made of rubies. The whole is surmounted by a closed royal crown terminating in a starry globe supporting a shining cross at the summit. Many other precious and semi-precious stones, such as emeralds and garnets, enrich this composition. During construction work at the end of the 19th century, the friars discovered in 1906 the 250 pipes of an organ from the time of the Crusades. Of course, this organ does not play any longer, because only the pipes remain, but it is the oldest known organ in the world. Along with the organ was found a carillon of 13 bells from the same period. It is thought that the organ and bells were buried in the 1=4th century by the Franciscans who wanted to protect them from destruction by the Muslims at that time. The ensemble of these instruments is obviously important for the history of music. 8) Are any of them still used regularly in liturgical celebrations? On of the characteristics of the Terra Sancta Museum is that the works on display will not be imprisoned behind hermetic glass but will continue to be used to give glory to our Lord. We have no desire to build a museum of the past. Our intention is to continue to celebrate the liturgy using this age-old patrimony. For example, each year, on Good Friday, during a liturgy that is unique to the Basilica of the Holy Sepulcher, we celebrate the Funeral of Christ by visiting the different sites of the Passion, reading the relevant Gospel text at each stop. The Custos and four deacons wear the cope and dalmatics donated by Queen Isabella II of Spain. The nails, the crown of thorns and the instruments of the Passion are placed upon four silver-gilt plates offered by the Spanish King Charles II. On the other hand, it is the Holy Roman Empire and Poland who gave the “pokal,” 16th century vases containing the ointments that are used for the Embalmment of Christ in the Stone of Unction. 9) There are many cathedrals in Europe that possess ancient vestments and exquisite liturgical objects, but often they do not use them. The Franciscans do. Why? When these objects came to us, they were not locked in the glass cases of museums, or strong boxes in the cupboards of the sacristy. We consider them in no way primarily as works of art but as liturgical objects. I see two ways of preserving an artifact. The first is to place it in a secure location, hidden and untouchable. The second is to use it. An object that is alive is not forgotten. Because we need it, we look for it, we find it, eventually we restore it, and in this way it is preserved. I think this second way of preservation is not understood by “civilian” museums. So our museum will be something very different. 10) The Franciscans celebrate the Latin rite in the Holy Sepulcher largely in the Latin language, side by side with the Greeks, Armenians, Copts, and Syrians. Do you think there is an ecumenical importance to the Franciscans’ Cultural Patrimony and to their liturgical ethos? Pilgrims coming to the Holy Sepulcher are often unpleasantly surprised by the situation they find there. The multiplicity of communities inside the same church appears to be a symbol of division. As one who lives there, I can say that ecumenical relations in the Holy Sepulcher are some of the best in the world. In Jewish theology, Jerusalem is the center of the world. It is the same for Christian theology. A map of the 16th century presents the world in the form of a pearl. Jerusalem is at its heart, and the three petals represent Europe, Asia, and Africa. Christ’s Church was born in Jerusalem, but following the stoning of St. Stephen, the first Christians were afraid and fled from the Holy City and in this way the world received the Gospel. Many different cultures with no relation with one another accepted the Gospel, and so different churches and rites were born. In a sort of centrifugal motion, the Church left Jerusalem and went out into the world. Subsequently, in a centripetal motion, pilgrims and different communities the whole world over returned to Jerusalem. To go back to the idea of the world map, at the Holy Sepulcher there are two African communities (Copts and Ethiopians), two Asian (Armenians and Syrians), and two European (Byzantine and Latin). The world and the entire Church of Christ (though, it is true, without ecclesial communion) is assembled around the Tomb of the only Resurrected One. Each of these Churches prays according to its tradition and culture. The Greeks pray in Greek, the Armenians in Armenian, and the Latins in Latin…Each Church deploys the riches of its liturgical and musical patrimony. Therefore, it is perfectly natural that the Franciscans prayer the Liturgy of the Hours, the conventual Mass, and the daily process entirely in Latin. Nevertheless, the numerous pilgrims who come to celebrate in the various chapels that belong to us (there are about 20 Masses per day) celebrate in general in their language and in the multiplicity of rites known in the Catholic Church. 11) How can people contribute to the Museum project or donate to the Franciscans in the Holy Land? We need every kind of help possible. The first way is to support us in prayer and to spread news about our project. We are also grateful to anyone who contributes economically to the realization of this great work. For more instructions, you may consult the site ATS pro Terra Sancta http://www.terrasanctamuseum.org/en/ where you will find a presentation of the project, as well as http://www.terrasanctamuseum.org/en/donate-now/ to make a donation online. Above all, all are invited to come to the Holy Land: a liturgical pilgrimage to the Land of Jesus allows you to gather the benefits of the whole liturgical year in just a few days. Beatrix Saule, President of the scientific committee, Honorary Head Curator at the Château de Versailles. Brother Eugenio Alliata ofm, Director of the Archaeological Museum of Studium Biblicum Franciscanum. Michèle Bimbenet-Privat, General Curator of the Department of Decorative Arts of the Louvre Museum. Benoit Constensoux, Art historian, Galerie Kugel. Andreina Contessa, Art historian, General Director of the Historical Museum of Miramare Castle in Trieste. José Manuel Cruz Valdovinos, Professor of Art History, Complutense University of Madrid. Thomas Gaehtgens, Art historian, Director of the Getty Research Institute in Los Angeles. Gael De Guichen, Adviser to the Director-General of ICCROM. Barbara Jatta, Art historian, Director of the Vatican Museums. Brother Stéphane Milovitch ofm, Director of Cultural Heritage of the Custody of the Holy Land, Liturgist. Przemysław Mrozowski, Honorary Director of the Royal Castle in Warsaw. Maria Pia Pettinau Vescina, Art historian, Specialist in ancient fabrics. Paulus Rainer, Conservator of the Kunsthistorisches Museum in Vienna, previously Director of the Kunstkammer. Danièle Veron-Denise, Honorary Chief Heritage Curator, Specialist in liturgical and profane embroidery. Raphaëlle Ziade, Head of the Byzantine Department at the Petit Palais, Musée des Beaux-Arts de la Ville de Paris. An admirable new resource for liturgical music has recently been made available by the University of Regensburg. Our readers might have already been acquainted with their impressive Antiphonale Synopticum, a database allowing users to compare versions of thousands of antiphons of the Divine Office from 12 representative manuscripts, in both adiastematic and diastematic notation. Now the Graduale Synopticum offers the same sort of synoptic tables for the propers of the Mass, allowing one easily to analyze the most ancient musically-notated versions of this repertoire. The result is similar to the Graduale Triplex, but much enriched with several additional manuscript sources. A truly spectacular achievement, invaluable for anyone interested in Gregorian chant. The introit Ad te levavi of the First Sunday of Advent according to ten representative manuscripts, as seen on the Graduale Synopticum: (from top to bottom) Angelica 123; Chartres 47; Laon 239; Benevento 34; Albi B. N. Lat. 776; Yrieix B. N. Lat. 903; Klosterneuburg; Zwettl 196; Montpellier. Thanks to the generosity of one of our loyal readers, we here provide an excerpt from Roma Sancta, an account of the Eternal City written in 1581 by Gregory Martin, S. J., the chief translator of the Douay-Rheims version of the Bible. Chapter 20: The Service of God in the Churches Manie Wayes, and the Peoples Devotion, and First of Masses. No man sayeth masse, but first allowed by a grave and worshipful priest; who fynding him meete and skilful in al comely ceremonies after the Romane fashion, commendeth him to an higher Officer; who geveth him leave for sixe monthes, and after for other sixe monethes, or more, or without limitation when he is once growen in credit, and that by subscribing his hand to printed paper for that purpose. Which testimonie, if he shewe, or if he be wel knowen otherwise, then (and not otherwise) shal he be admitted to say masse in any place in Rome or in the teritorie therof, wheresoever his devotion serveth. And this is generally and exactely observed toward al straungers, for as for the Romanes them selves that are made priests, they learne the Ceremonies even from children, by nature, custome, and Tradition, in such comely maner, with such reverence and maiestie, that herein (no doubt) Italie excelleth, and Rome especially, as most exactly observing at this very day the grave sinceritie of the old primitive Church. And thus much of the uniformitie and reverent comlinesse. See now the provision that is there, for al that in this order can and are disposed to say Masse. for example at S. Peters, thou shalt have in the vesterie (verie fayre and large) from early morning until noone, upon a long table, so many Chalices with al their furniture, these many fayre albes with their vestimentes of whatsoever colour thou wouldest, according as masse requireth which thou meanest to say, for martyrs, red; for virgins and Confessors, white; for Diriges, blacke, whearof I wil say more in an other place. There is the cheefe Sacristane or master of the vesterie ready in his surples attending, and under him a number of pretie boys in gownes and surplises, most ready and diligent to attend upon thee. And the first question is, At what aultar thou wilt say, and what masse, and then wil they appoynt thee a vestment accordingly: and if thy aultar be voyd, thou shalt goe at thy pleasure: if not, either stay til he come in that is there before thee, or take an other. but the Privileges of some aultars ar such, namely of the Seven altars, or in other Churches of five Aultars, and the Relikes and bodies of Saintes adde such devotion and religion to other Aultars, namely S. Andrewes, where S. Gregorie the Doctors body is underneath, and S. Andrewes head above: that among so many as come daylie out of al Rome to celebrate in such places, a man some time must stay a good while, and yet the Canons them selves of purpose geve them to straungers, of charitie yelding to other mens devotion. Now then, when thou art to be revested, there is water and towel for thy handes, a place to lay thy uppoer gowne, (for the under Cassock is downe to the foote,) a chappel to knele in before if it please thee, a body in gowne and surples ready to revest thee, and that done, he taketh the booke, and the Crewettes with wine and water alwaies new and fresh for every Masse, two tapers (for they never use under two,) and so goeth before thee, and thou in modest and solemne maner folowest, thy left hand holding the Chalice, and thy right upon the patent and burse to stay it, thy cappe on thy head, unles thou come before the B. sacrament, then Cap of and one knee to the ground. Now concerning the people, they are there continually expecting the beginning of some masse, that they may heare the whole, and as sone as the boy hath sounded the litle bel that hangeth in the way betwene the vestrie and the Churche, they goe flocking by and by round about the priest, attending upon him unto the aultar, and there kneeling with him, bowing with him, blessing with him, answering him, lifting up their hartes with his prayers and ceremonies, and wholy occupied in harkening to him, and onely attent to the holy mysteries and blessed wordes of the masse, so that they never use booke at that time: and at the Gospel, every man goeth up as neere as he can to the aultar, and afterward returneth to his place agayne as doing a special honour unto it, and desirous to heare it, and in al their behaviour there is such comelinesse, and such silence, that neither in gesture nor voyce is there any thing to offend any man, but to edifie excedingly and to please a straunger wonderfully. only this thou shalt heare verie often, devoute persons by aboundance of good and vehement spiritual motions, breake out eftsones into sighinges and groninges, to see the blessed Sacrament, to heare the passion of Christ, to behold his agonies, and the cruel martyrdomes of his servauntes; upon occasion of such meditations, the mouth sodenly sounded the inward conceite of the hart. And having thus heard masse to the very end, every one saluteth each other, which is solemly observed, and so they that wil, depart. But in the meane time there ar commonly so many masses, as there be aultars in the body of the Church, which is ful of them according to the custome there, and they are built everie way, North, South, East and west, and in no place so commodiousely for the sight of the people standing round about, and very neere, and yet every one so inant. As I have for example sake spoken of S. Peters, so is it in other Churches in their degree. And in al places where a mans devotion would move him to say masse, there is al provision for him without al difficultie, only in some Chappels and aultars more desolate but of singular reverence and devotion, a man must have his minister or assistant with him. And thus farre of masses in general, for as concerning the daily masses of al the Religious houses, of al Cathedral Churches, of Confraternities, of Hospitals, of foren nations, either never ceasing from houre to houre for the peoples commoditie, or insituted to special good purposes, as, for al such dead as otherwise have no frendes to care for them, for them that are executed by justice, for labourers that are to worke al day and would heere mass before early in the morning, for these and other godly and charitable respectes, These Masses I say being infinite, the Reader partly of these few wordes may conceave what might be sayd and partly I shal speake somewhat more of them in their places, hearafter.